Filing a PrevAcid lawsuit could be an option for individuals who suffered complications allegedly related to use of the Proton Pump Inhibitor (PPI). Research indicates that heartburn medications included in the PPI class might be associated with a number of side effects, including an increased risk of heart attacks and Chronic Kidney Disease. Bernstein Liebhard LLP is now investigating personal injury claims on behalf of patients who may have been harmed by PrevAcid. To learn more about the options available to you, please call (888) 994-5118 to get in contact with a member of our legal team. It is estimated that PrevAcid (lansoprazole) and other PPIs are used by 14% of Americans to control various digestive conditions, including gastroesophageal reflux disease (GERD) and peptic ulcer disease (PUD). The first PPI was introduced in the late 1980s, while Takeda Pharmaceuticals brought prescription PrevAcid to market in 1995. At its peak, Prevacid was the second highest-selling prescription drug in the U.S. with annual sales of over $3 billion. Novartis obtained approval for over-the-counter PrevAcid 24HR in 2005. Over the years, PPIs such as PrevAcid have been linked to a number of serious complications, including bone fractures and low serum magnesium levels. Recently, however, new research has raised concern that these drugs might also increase a patient’s risk for heart attacks and Chronic Kidney Disease. Since at least 2002, some research has suggested that the use of PrevAcid and other PPIs might increase the chances that an individual will suffer a heart attack. However, concerns were heightened in 2015, after two studies published in PLOS One suggested that the drugs may raise the risk of heart attack by as much as 21 percent. Unlike previous research, these studies looked at the “general public” rather than patients who already had a history of heart problems. A similar increase in risk was not seen among patients taking alternative antacid treatments, including Zantac and other H2 blockers. In January 2016, research published in JAMA: Internal Medicine raised new concerns about PPI safety, as the findings indicated that the heartburn medications might place patients in danger of developing Chronic Kidney Disease. Overall, the study indicated that the drugs increased risk by 46%. But when demographics, socioeconomic, and clinical variables were taken into account, a 50% increased risk was detected. Once-daily use was only associated with a 15% increased risk, while twice-daily use was linked to a 46% increased risk. You may want to consider filing a PrevAcid lawsuit if you or a loved one were diagnosed with stomach cancer following long-term treatment with this proton pump inhibitor medication. According to a study published in the September 2017 issue of Gut, patients who take proton pump inhibitors like PrevAcid for a long period of time may be twice as likely to develop the disease compared to those who take another class of heartburn drugs called H2 blockers (such as Zantac or Pepcid). The Hong Kong-based researchers who conducted the study were investigating why patients successfully treated for H. pylori infection – a risk factor for both gastric ulcers and stomach cancer – sometimes still go on to develop cancer. They followed 63,397 patients who had successfully undergone treatment to eradicate the H. pylori bacteria. Of these, 3,271 used PrevAcid or another proton pump inhibitor and 21,179 were taking an H 2 blocker. During the 7.5 years in which they were followed, 153 of those patients developed stomach cancer. In addition to linking proton pump inhibitors to an increased risk of gastric cancer compared to H 2 blockers, the analysis suggested that the cancer risk increased the longer the medications were used. 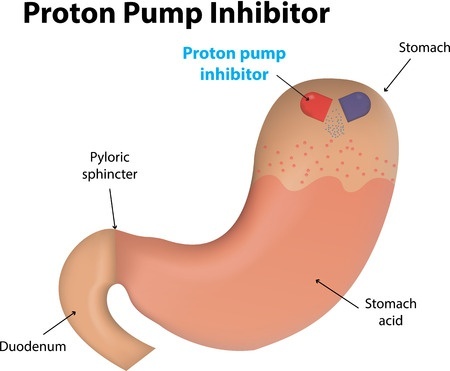 Patients who took proton pump inhibitors on a daily basis were than four times more likely to develop stomach cancer compared to those who only used the drugs once per week. Patients who took proton pump inhibitors for a year were five times more likely to develop gastric cancer. Taking a medication like PrevAcid for two years or more increased the risk of stomach cancer by more than six-fold. The risk of gastric cancer increased more than eight times when proton pump inhibitors were used for three years or more. If you are interested in pursuing a legal claim for complications that may be associated with Prevacid, please call (888) 994-5118 to arrange for a free, no-obligation review of your case.